Dean Louis Marten, 49, of Long Grove, Iowa, died Thursday afternoon, January 17, 2019, at home. He was born April 17, 1969, in Davenport to Louis and Burnette (Ganzer) Marten. Dean graduated from North Scott High School in 1987. He married Dori Seifert March 26, 1994. 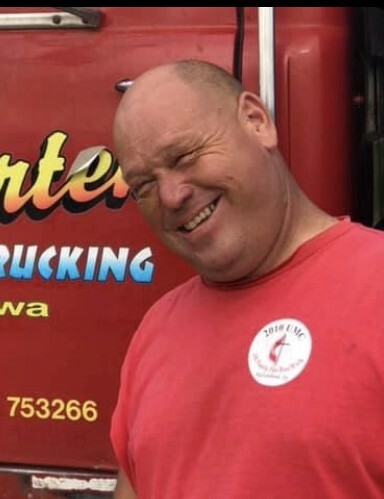 Dean was self employed all of his life at Marten Farms and Trucking. He was actively involved as President in the Long Grove Sportsman's Club and Silver Spurs Saddle Club. Dean was also active in North Scott FFA Alumni where he had served as President. He enjoyed cooking, grilling and entertaining. Dean was a friend to all and knew no strangers. Surviving are his former wife, Dori; children, Jami (Ben) Rathjen of Donahue, Dean (Angela Meyer) Marten of McCausland, Jimy (Cecelia LaBarge) Marten and Jebb (Brodina Bousselot) Marten of Donahue; grandchildren, Emery and Cora Rathjen; his mother, Burnette Marten of Long Grove; siblings, Judy (Robert) Disney, Daryl (Patty) Marten and Mike (Glenna) Rohlf all of Davenport; nieces and nephews. Preceding Dean in death was his father, Louie. The family will receive relatives and friends at St. Ann Catholic Church, Long Grove from 3:00 until 7:00 p.m. Monday, January 21, 2019. A service will be held at 10:30 a.m. Tuesday, January 22, 2019, in the church. The Rev. Sylvia Larssen will officiate. Burial will follow in the church cemetery. In lieu of other expressions of sympathy, memorials are suggest to the Juvenile Diabetes Research Foundation. Pallbearers will be Steve Marten, Bill McGimpsey, Denny Peters, Dave Liske, Paul Steward, Paul Radcliff, Scott Larssen and Quentin "Bubba" Benthin.